Paradigm Infotech has been a strong IT partner to many of our customers. Our goal is to continue to develop strong skills in the existing areas of engagement as well as expand onto other areas in future. 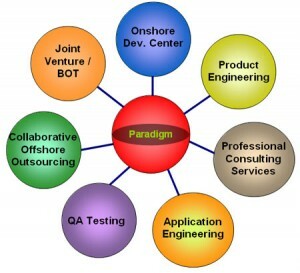 Paradigm provides cost-efficient offshore product engineering for software companies for a complete lifecycle service for the development of product, including assisting in product architecture, development, QA and testing, product documentation, implementation assistance, product customization, enhancements, support and helpdesk and product knowledge transfer. And we offer this service globally (US, Europe, APAC and Australia) to our product partners. Paradigm offers full lifecycle application development for our customers including Project management, Systems engineering, Architecture design, and application development, documentation, training and implementation followed by ongoing support and maintenance. We offer these services bundled with our experienced professionals in our focus industry groups, but not limited to Life Sciences / Healthcare, Manufacturing /Retail, Supply Chain Management, Workforce Management and Government. Having many of its staff with product and application development expertise over the years, Paradigm is well qualified to offer these professionals on consulting services to our customers. We have many consultants with comprehensive skills with both business and technology combined. We offer these talents at one of the most competitive pricing model to our valued clients. Call us and we can provide the details. We, at Paradigm realized that to being a successful IT company, we must ensure that product development and related services that we provide are of the highest-standard. If we need to adhere to quality delivery to our clients, we have to follow stringent Quality Assurance (QA) and testing practice of what we deliver. So, it all started with us first in-house. Since then, we feel that we can offer our success-proven methodology on QA and Testing to our clients for their internal or external application testing purposes as well. Paradigm offers both onsite and a price competitive offshore development models. Our offshore model is a combination of onsite project coordinator and our talented offshore delivery team in full synchronization of the project. We found that having an onsite person coordinating between the customer and the offshore team is the most successful method of ensuring project success and base all of our offshore projects on this method of execution. Paradigm has multiple offshore delivery centers in Southern India. Another area of offshore engagement model we offer is the collective outsourcing. In this model, Paradigm establishes a dedicated offshore resource pool to our customers. The key people on this assignment work directly for the customer and provide all necessary development and support functions to the customer. Paradigm provides the infrastructure and facility to the customer needs. The customer also has the ability to set up a “bench-reserve” at a lower cost while the resources are not being utilized. In addition to our outsourcing and offshore models, Paradigm is open to setting up joint-ventures with end-customers or technology companies that require trained and certified resources for large projects. In this model, Paradigm and the client will jointly share the costs and profitability of the project. Another model under similar method is Build, Operate and Transfer (BOT) model. Paradigm has experience in establishing a successful offshore center with infrastructure and resource talent and will provide the similar to clients needing an offshore center, but not having an ability or expertise to setup such center. Please talk to us on any of the above requirements and we will be happy to discuss the details as to how Paradigm can provide a suitable solution to these requirements.